If you’re considering a dental implant tooth replacement plan, you probably have some questions. 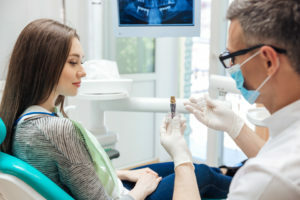 While these restoration plans have become the gold standard for many dentists, most patients are still unfamiliar with dental implant treatment. In this post, we’ll talk about some of the things that patients should know about dental implant supported tooth replacement before starting their treatment. Dental implants have become one of the most popular tooth replacement options because they are the only dental restoration that restores the root and crown (visible portion) of the tooth. Because dental implants replace the root structure, they are not reliant on surrounding teeth for support, and the implant posts provide necessary stimulus for bone and gum tissue retention. Innovations in dental implant techniques and technology have made them increasingly viable, and they now have a 98% success rate. When it comes to successful dental implant placement, your Boston Smile Center team works hard to provide the skill and quality materials necessary for a successful surgical procedure, but after the procedure, the success of implant placement is in your hands. An attractive, open smile is an invaluable asset in your personal and professional life, conveying confidence, charisma, and a whole host of positive attributes in a single flash of your pearly whites. If your teeth are crowded, misaligned, or unevenly spaced, you may find yourself hiding your smile in public and in photographs. Fortunately, there is a teeth-straightening solution that doesn’t involve the use of metal wires and brackets: Invisalign clear aligners. Dr. Alan Sasson at Boston Smile Center is a 2014 Invisalign Preferred Provider serving Brookline, MA and the surrounding areas. Our team would love to show you how much of a difference Invisalign can make in your smile and in your life. If you are a candidate for Invisalign orthodontic treatment, we’ll begin the process of straightening your teeth by taking precise digital measurements of your dentition. This data will be sent directly to an Invisalign lab where your custom aligners will be created. When we receive your aligners, we’ll assess your bite to ensure optimal fit and comfort. The rest is easy! Simply wear your clear, comfortable aligners for the designated amount of time each day for a period of about two weeks for each set. As time passes, you’ll graduate to the next set of aligners in the series until treatment is complete. With Dr. Sasson’s guidance, you’ll begin to see your new smile emerge in no time! Because we want you to begin enjoying the innumerable benefits of straighter teeth as soon as possible, Dr. Sasson also offers Propel Orthodontic technology. This revolutionary solution actually improves the restructuring process within your jaw as your teeth are shifted into their final positions. Capable of reducing orthodontic treatment duration by up to 60 percent, Propel has been successfully utilized with both traditional braces and the Invisalign system. We genuinely look forward to becoming your partners in your journey toward a healthier, more balanced smile with Invisalign clear aligners. If you’ve been dreaming of straighter, healthier teeth and a more confident smile, Dr. Sasson and his team can help. 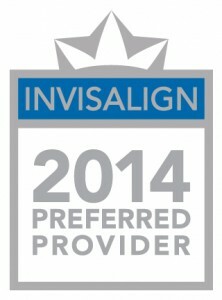 Contact our office in Brookline, MA today to schedule your Invisalign consultation with our caring, experienced team. Remember to ask about the Propel Orthodontics system as well to find out if you’re a candidate for even more rapid orthodontic treatment. Our state-of-the-art dental practice proudly serves families from throughout Brookline and the surrounding areas, including Boston, Cambridge, Somerville, Newton, Chelsea, and more. As we age, our skin inevitably begins to show the tell-tale signs of time. Wrinkles, fine lines, drooping contours and deep creases can make you look years older than you truly are. While plastic surgery is a viable solution for some, we understand that not everyone wants to commit to an invasive procedure to achieve youthful, beautiful results. At Boston Smile Center in Brookline, MA, Dr. Sasson and his team know that your time is a valuable commodity. That’s why we offer the advanced cosmetic technology of dermal fillers and BOTOX® Cosmetic in the same office you visit for all of your dental care needs. How Can Cosmetic Solutions Help Me? Fortunately, cosmetic injectables like BOTOX® Cosmetic, Restylane and Juvederm can help restore your skin’s youthful vitality in a way that isn’t invasive like traditional plastic surgery. Dr. Sasson’s expertise and experience help you reclaim the firm, radiant skin you miss from your youth in a way that makes you feel comfortable and confident. Millions of men and women have already experienced the numerous benefits associated with cosmetic injections like BOTOX® Cosmetic, Juvederm, Restylane and more. Contact our office in Brookline, MA today to find out how Dr. Sasson can help you achieve the smoother, fresher face you desire, all in a warm, welcoming atmosphere that makes you feel right at home. Our practice also serves patients from throughout the nearby areas of Somerville, Newton, Boston, Cambridge, Chelsea, and more. In each case, patients can look forward to care that’s more comfortable, more precise, and requires a much shorter recovery period. In fact, thanks to laser dentistry, patients can get the care they need without requiring stitches. That’s because our Brookline office’s laser promotes healing as it works, letting you get back to your normal schedule much sooner. Laser dentistry can’t be used for every kind of service, though. That’s why, if you’re hoping laser dentistry can help you, we invite you to call Boston Smile Center for a visit with us. During your FREE consultation appointment, Dr. Sasson can take a thorough look at your teeth and gums to find out what kind of care you need. Then, once we know more, we can recommend a specific treatment plan to help you out. That treatment may involve laser dentistry, or it may involve something else completely. Call us today to reserve a FREE consultation. We look forward to hearing from you! What happens when teeth become worn, decayed, or cracked? Your confidence and your oral health can suffer. That’s why Dr. Sasson and his team at Boston Smile Center offer porcelain crowns. With all porcelain crowns and fillings, patients from Brookline/Boston and beyond can look forward to having a beautiful smile and a restored sense of self-confidence. How Can Porcelain Crowns Help Your Smile? Porcelain crowns let Dr. Sasson preserve damaged or decayed teeth by capping them with a crown instead of extracting them. As a result, your jaw stays strong and healthy even as your smile gets the help it deserves. What’s more, because porcelain mimics the look of natural teeth, you can have your old smile back. And thanks to Dr. Sasson’s method for creating porcelain crowns, we can deliver something that’s custom-made, that matches the shade of your surrounding teeth, and that fits in with your overall appearance. What does a porcelain crown fix? 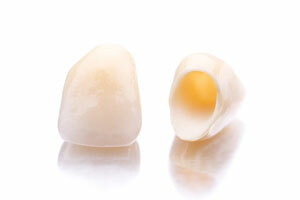 Do you want to know more about porcelain crowns and how they can help you restore your smile? Call Boston Smile Center today to schedule your FREE consultation with Dr. Sasson. During your appointment, he can tell you if porcelain crowns are right for you and recommend a treatment plan. Have you ever wondered if a dental implant might be right for you? You may have lots of questions you want to ask. From now through September 13th 2012, we are offering a free dental implant consultation with Dr. Sasson. Refer to the promotion here and then call our office at (617) 739-1017. Hope you are enjoying these last few weeks of summer before fall sets in. Comments Off on Free Dental Implant Consultation!